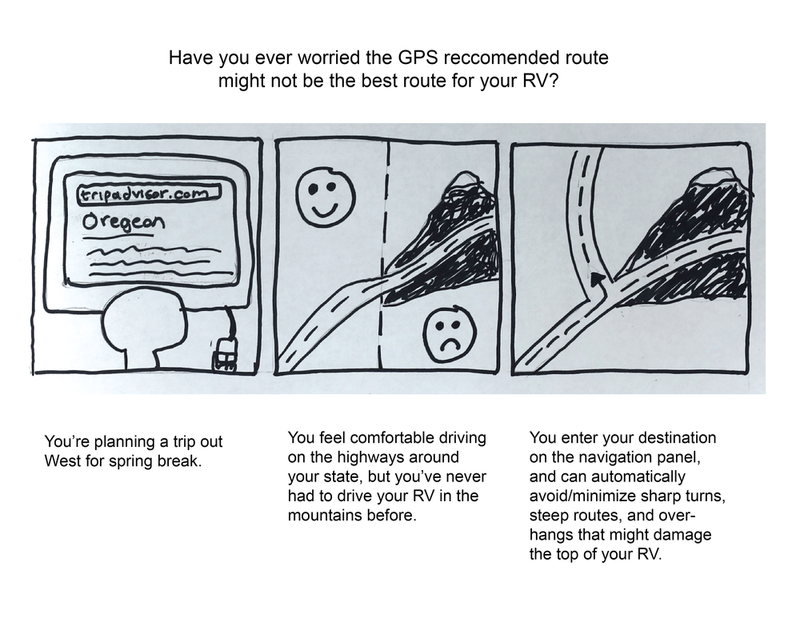 a connected GPS for RV drivers who want to stay safe on the road while maintaining their sense of independence. Design a service that reimagines vehicles as sensor platforms that participate in a connected ecosystem. We created a smart GPS designed specifically for people who use RVs as their primary living space. Our service acknowledges their need for a specific type of way-finding while fostering their sense of adventure and autonomy, as well as augmenting the existing sense of community among RV drivers. 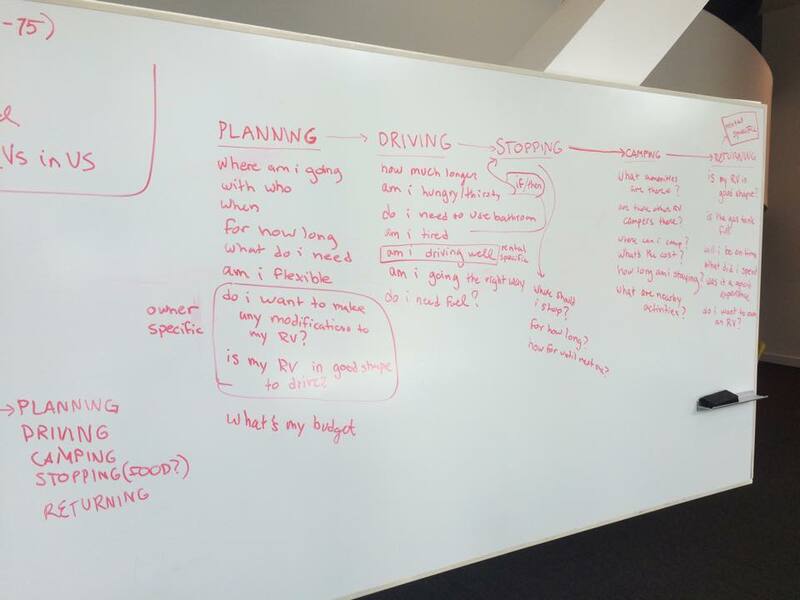 I learned how to conduct user research that uncovers desires through storytelling. I also learned to design services with a sense of restraint and simplicity, for a self-starting and adventurous group of people. 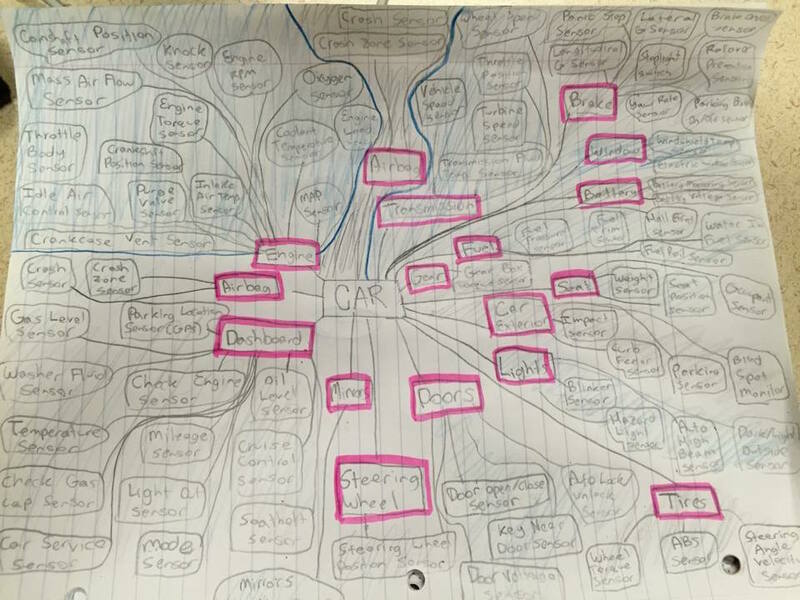 We did secondary research, and made lists and groupings of various sensors that are found in cars. This was both to help us understand how sensors helped vehicles work currently and then to imagine how they might change in the future. We then grouped the sensors in different ways to examine opportunities. For instance: basic areas of user desire that they contributed to: vehicle functionality (does it get me from place to place? ), vehicle safety (does it keep me safe? ), and experience (am I comfortable and happy when I drive?). A lot of companies today are thinking about how networks of sensors have potential to change driving experiences, whether this is something like Uber Carpooling or self-driving cars. We thought it might be more challenging and exciting to consider how sensors could change the experience of people who don't just need to get from Point A to Point B, but for whom the adventure and experience of driving is deeply important and part of a larger lifestyle of self-sufficiency. We conducted secondary research online about RV ownership and use in America. We also visited an RV rental shop in Pittsburgh to get a better idea of what it would be like to occupy one full-time. This exercise gave us a much better understanding of who we were designing for, and allowed us to relate more directly to the people we interviewed later in the project. We imagined the process of acquiring and traveling in an RV from different perspectives and with different goals in mind - renting, owning, short trips, long trips, etc. 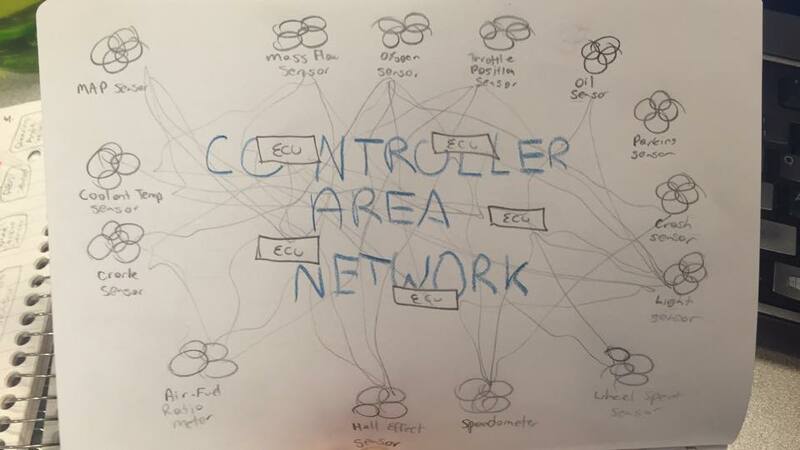 We created a map of ways these stakeholders interact with one another, and then imagined the ways that different drivers might feel during the stages of their RV trip, from start to finish. Creation. Based on our research and journey mapping, we created storyboards to conduct needs validation during interviews. 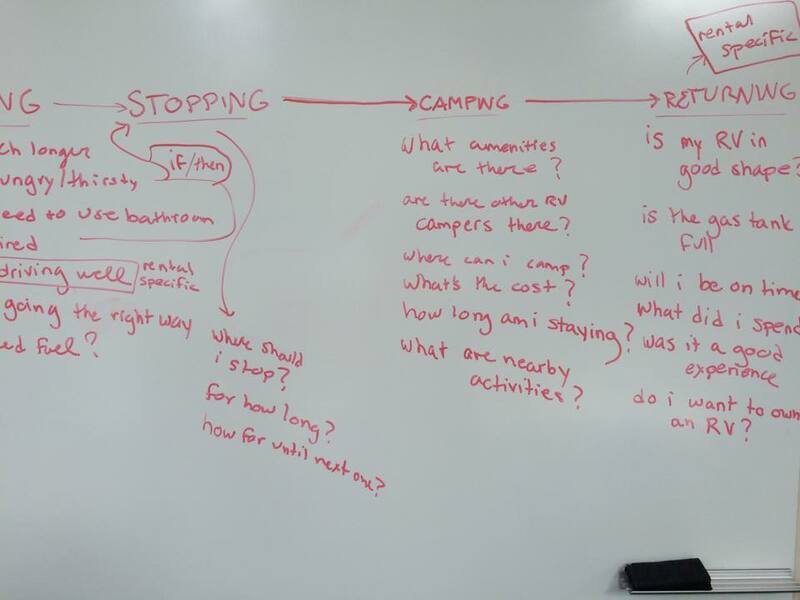 We wondered about the main problems that RV drivers experienced on a daily basis, and ways to solve them - we hypothesized that drivers might want self-driving RVs, load-balancing sensors, cameras to help them make tight turns, fuel efficiency trackers, and optimized trip planning. We went onto special interest forums online and recruited full-time RV'ers for Skype and telephone interviews - at times this was extraordinarily difficult because of their limited internet connections! Interviews. Our interviews were so valuable for teaching us about the underlying desires and behaviors of people who live in RVs. They didn't seem to think at all about the things we thought were exciting opportunities; for example, they didn't care about fuel efficiency, because they took this cost into account when they made the lifestyle switch. Also, a lot of them already had workarounds for some of the problems we presented, like cameras for tight turns, and they seemed really proud that they'd figured it out themselves. Their pride and individuality was really tied into the DIY nature of making their RVs better. What We Learned. 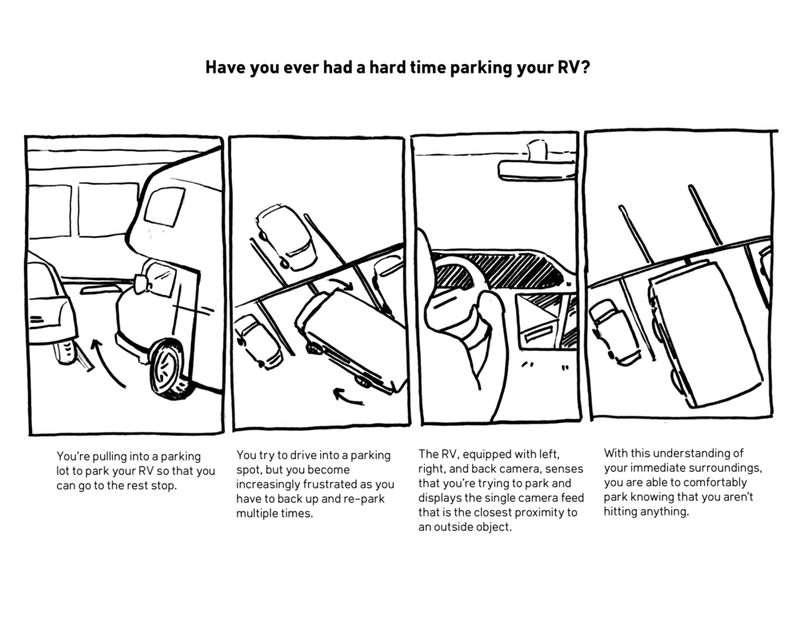 We learned that RV drivers actually had a ton of problems while driving, but it was nearly impossible to get them to admit it! One man we spoke with said he didn't need any help navigating, and then promptly launched into a story about getting stuck in the mud just a few days prior after taking a wrong turn on a scenic route. Another couple regularly spent hours scouting ahead on motorcycles to ensure their route would accommodate their RV. 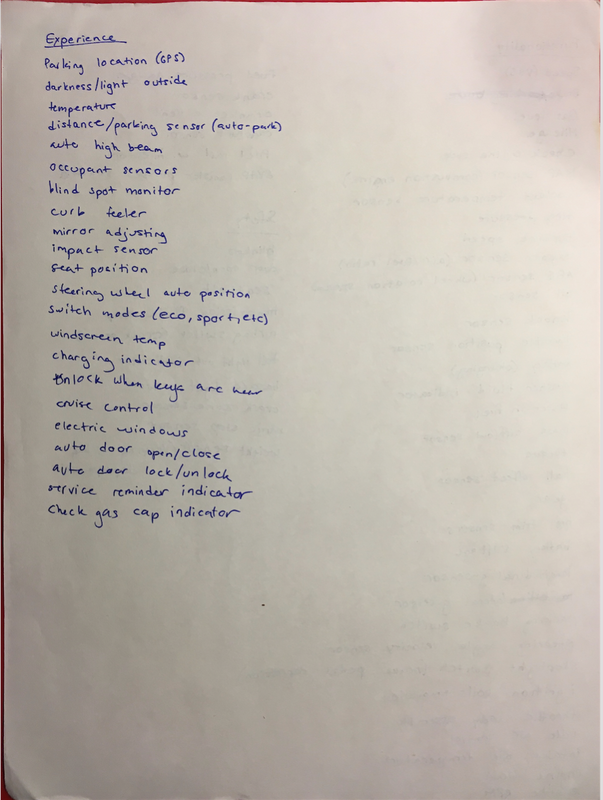 In almost every case, RV drivers came in pairs where one drove and the other handled atlases, map apps, and weather forecasts in order to plan the route. Opportunity. We realized that there was an opportunity for a solution to help RV drivers avoid dangerous weather and bad road conditions without making them feel like their route planning - something they take pride in - was being "handled" by a third party. It would have to be highly customizable, minimally distracting, and able to coalesce data from multiple sources into digestible and actionable information -- and then deliver that information in an unobtrusive way. 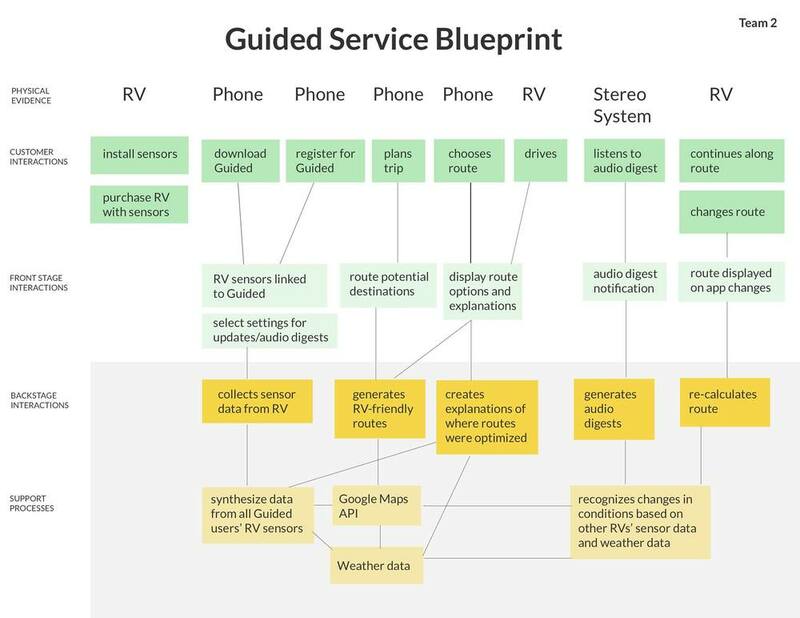 Guided is a service for RV drivers delivered through a mobile application. It takes sensor data from different parts of the RV and uses it to create location-based and context-sensitive information about situations like road conditions and weather. This information gets used to help other RV drivers navigate, and delivers an audio digest for drivers currently on the road. 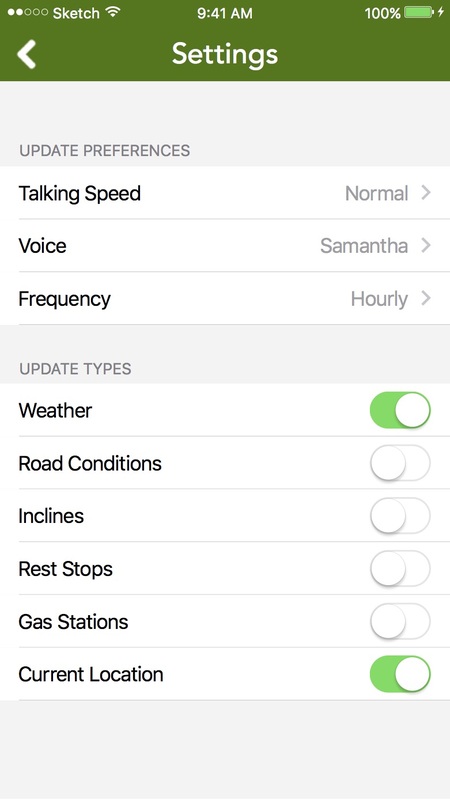 Drivers can determine ahead of time which categories of information they’d like to receive information about. Guided also holds value as a business case. RV drivers frequently purchase applications that cater to their lifestyle, such as AllStays. There is an option that very few people take to purchase a $300 RV-specific Garmin GPS, but we believe we can provide this value for less by capitalizing on sensor placement on RVs. 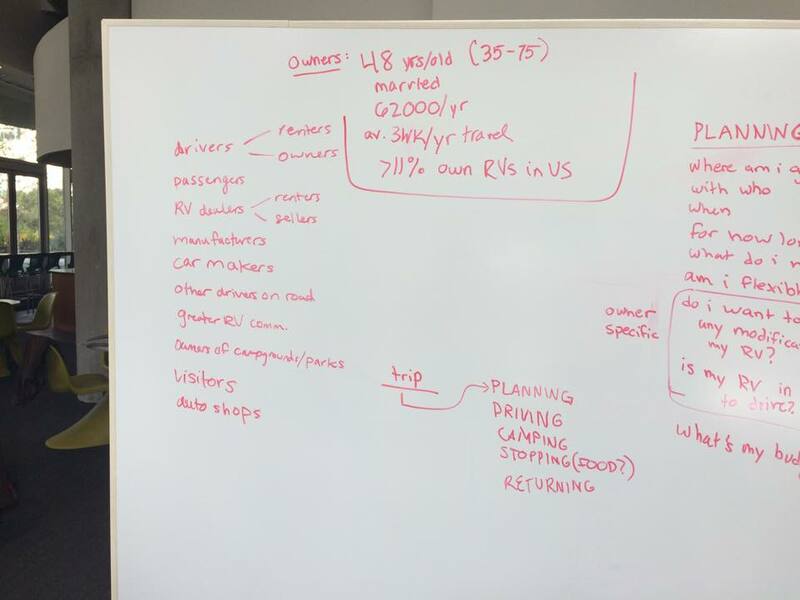 This business model is supported additionally by the sense of community present in RV driving as a lifestyle and the present increase in RV purchases across America, which we believe makes crowdsourced sensor data a viable option for this application.